Now offering 100% homeowner financing! Don't want to finance? We accept all major credit cards. Premier Window Fashions provides the highest quality window treatments in San Luis Obispo and Santa Barbara. We offer a variety of shutters, blinds, and shades and we pride ourselves on delivering the best solution to your window covering needs. For us, this starts with partnering with the highest quality, domestic manufacturer. 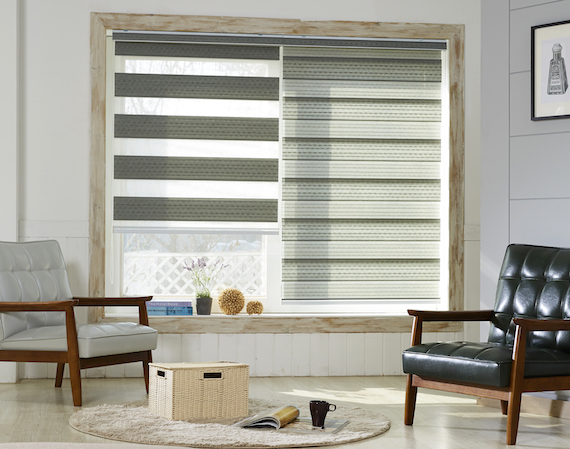 Our manufacturer, Skandia Window Fashions, makes 100% of their product in the United States, and custom-makes every blind, shutter, and shade to order. Skandia Window Fashions manufactures a wide variety of products, such as: vinyl plantation shutters, wood plantation shutters, faux wood blinds, wood blinds, roller shades, woven wood shades, cellular shades, and vertical blinds. We combine high quality, American-made shutters, blinds, and shades with a service-oriented approach. We consider ourselves consultants, and we believe that our mission is to provide the best solution for homeowners in San Luis Obispo and the surrounding area. Our service-oriented approach begins with an in-home consultation, where we discuss your needs, your design preferences, your budget, and your schedule. Our service doesn't stop at the sale. We will personally install your blinds, shutters, or shades, and we will service them under warranty as needed. The result is high quality, American-made window treatments, that are professionally installed. So if you're in the market for custom-made blinds, shutters, or shades, give the experts at Premier Window Fashions a call. Both Eric and Joe did an outstanding job installing the new shutters in our home. Diana and I were extremely satisfied with the precise workmanship, explanation of the installation and finishing touches around the shutters throughout the main house and casita. We would happily recommend Eric and Joe to any other potential clients. Eric Brink installed shutters in our home. He arrived on time and was personable. He maintained a clean work area and professionally installed the shutters. During the installation, Eric identified problems with some existing shutters we had and quickly made the repairs, free of charge. We appreciate his punctuality and thoroughness. We would recommend Eric and Joe for any future consultations or installations.